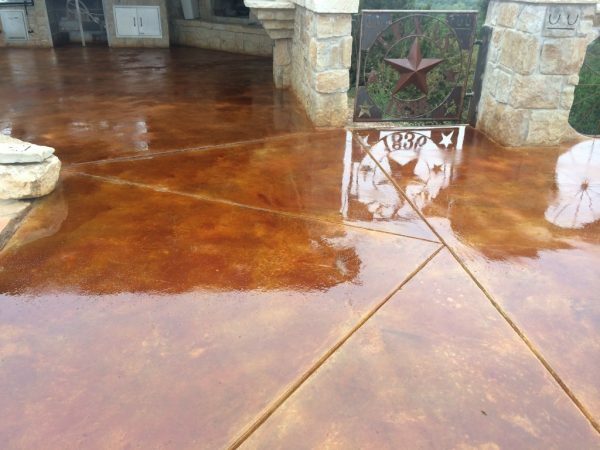 Decorative concrete cutting, or scoring, can transform a drab slab of concrete adding character and aesthetic value. Sawing patterns range from simple geometric shapes to complex designs with intricate details. The skilled concrete artisans at Dyon Construction can use their artistic ability to carve beautiful designs, lines, logos, and repeating patterns into the floor. Decorative scoring adds a dimension to flooring and pairs well with stains and dyes to provide visual interest and beauty to a room. Initial Sketch – Prior to making cuts into the substrate, contractors will first draw a prototype and establish the design’s parameters. Chalk Drawing – Most contractors will then apply a chalk drawing on the slab to serve as a guide when the scoring process begins. Our network partners are careful not to seal or spray the chalk line in order to avoid unwanted reactions later during the staining process. Control Joints – Before initiating the design cuts the contractor will make strategic control joints to prevent the concrete from cracking. Though concrete scoring can be quite challenging for amateurs and do-it-yourself types, our professional concrete designers equipped with top-grade equipment are able to accomplish fabulous designs in a minimal amount of time. Circular Saws – Used for detailed cuts, stright edge guides usually needed.